Nallur Kandaswamy Kovil or Nallur Murugan Kovil is one of the most significant Hindu temples in the Jaffna District of Northern Province, Sri Lanka. The temple is a socially important institution for the Sri Lankan Tamils Hindu identity and many temples have been built in Europe and North America using the same name as a cultural memory. The presiding deity is Lord Muruga (son of Lord Siva a.k.a. Karthikeya) in the form of the holy Vel. The idol of the Nallur Devi or goddess was gifted to the temple in the 10 century AD by the Chola queen Sembiyan Mahadevi, in the style of Sembian bronzes. The Nallur Kandaswamy Temple’s foundation was laid in 948 AD on the land called “Kurukkal Valavu”. Due to invasion of foreigners, the temple had to be relocated several times in different places within Nallur area. It is believed that there was a shrine dedicated to an Islamic sufi saint in the temple complex from 1734 to 1749 which was relocated in 1749 when the temple structure was built. According to the Yalpana Vaipava Malai, the temple was developed at the site in the 13th century by Puvenaya Vaku, a Minister to the Jaffna King Kalinga Magha. Sapumal Kumaraya (also known as Chempaha Perumal in Tamil), the adopted son of King Bhuvanekabahu, the King of Kotte, is credited with either building or renovating the third Nallur Kandaswamy temple in the 15th century. 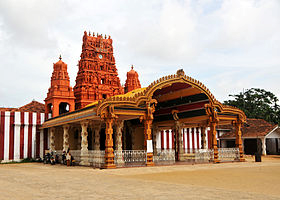 Nallur served as the capital of the Jaffna kings, with the royal palace situated very close to the temple. The rebuilt temples that exist now do not match their original locations which instead are occupied by churches erected by the Portuguese. The temple which was at Sankili Thoppu was demolished by the Portuguese General Philip de Olivera in 1621. The Dutch took over the Jaffna District in 1658. A church was erected in the site at Sankili Thoppu where the temple stood. The fourth and the present temple was constructed in 1749 A.D. during the Dutch colonial era by Krishna Suba Iyer and Ragunatha Maapaana Mudaliyar in the 'Kurukkal Valavu', which is the original temple premises. The original shrine had only two main halls and didn't have a clock tower, or any ornately carved towers or gopuram. The first clock tower was erected in 1899, and the main hall where the vel or lance of the deity resides was re-furbished in 1902. In 1964, the 'Vasantha Mandapam' or grand hall was renovated to have the present look and feel. The temple has the main entrance facing the east. It has an ornately carved five-story tower or gopuram in the Dravidian architecture style at the main entrance. In the surrounding inner yard, it has shrines for Lords Ganesh, Vairavar, Sun and Sandana Gopala. In the southern part of this temple, the holy pond and Thandayudhapaani shrine dedicated to another aspect of Lord Muruga can be seen. In the northern side there is a big holy garden. The annual Festival starts with Kodietram (flag-hoisting) on the sixth day following the New Moon in the month of Adi (August) and continues for twenty five days. The deity goes round the inner precincts at noon and the outer precincts in the evening daily. Lord Skanda or his vel, as the case may be, does the rounds accompanied by the consorts Valli and Teivayanai. The Vahanams (vehicles) are of a rich variety ranging from Silver Peacock, Silver Swan, Silver Rishapam, the Cobra, the green Peacock, the House etc. The Kailaasa Vahanam, the manjam (bed) and the Ther (chariot) are special attractions. Devotees and penitents can be seen bearing kavadis and piercing their bodies with hooks and spears without seeming to cause any pain or harm, as an act of faith and atonement.